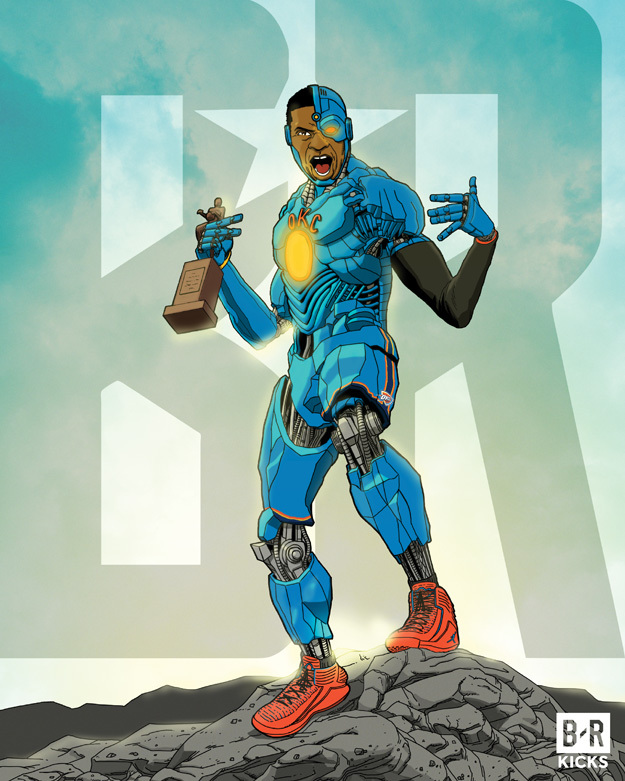 Here’s my illustration of the Cyborg/ Russell Westbrook mashup. It was inspired by the Cyborg Justice League movie poster. I affectionately referred to this piece as “CyBrook”. He’s wearing the Nike Air Jordan 32 OKC Player Exclusive colorway. The outfit’s color scheme is based on the Thunder’s blue, dark blue, and orange colors. He’s in a dance-inspired pose, as he’s known for his on and off-court dancing. The OKC letters logo is on his chest. The chest glow and eye glow are the Thunder’s orange color. There’s the Thunder logo on the side of his thigh, with his upper legs painted like he’s wearing shorts. He’s wearing a black arm sleeve and Thunder colored wristbands like he does during games . He’s holding the MVP trophy in his right hand.